With Henley rowing under normal conditions, pace and form are fairly easy to judge, chiefly because it is easy to obtain accurate information as to times taken for trial rows. On the 1919 occasion, however, the man who lurked about the river bank with a stop-watch found a good deal of evenness about the times taken. Most of the crews entered for the King's Cup had strong followings. Canada and France were least favoured, and critics divided their approval between the two Universities, Australia, New Zealand, and America. The Regatta was held on July 2nd, 3rd, 4th, and 5th. The opening day was devoted to heats of the minor events, and the weather had changed from the sunshine of the previous six weeks to showers, which made things very uncomfortable for spectators. The Australian sculler, A. S. Cox had been scratched, so that the A.I.F. men had no personal interest in the first day's racing. The draw for the heats in the King's Cup had, unfortunately, pitted the two Australian crews against one another. They were the first two drawn out of the hat, so that fate was not at all kind in the beginning. The race was rowed at 11.5 a.m. on the second day of the Regatta. As the crews had done all their final hard work together, their capabilities were well known and there was little interest in the race. It resolved into a strong paddle, which No. 1 Crew won by three-quarters of a length in 7mins. 31secs. The Henley course is 1 mile 550 yards. It was extremely unfortunate that the No. 2 Crew had not an opportunity of trying their pace against some of the other crews entered. The other heats in the King's Cup were between Canada and Oxford University, New Zealand and Cambridge University, France and America. Oxford University and Canada provided only a moderately interesting race. The University crew had a lead of half-a-length at Fawley which is about three and a half minutes' rowing, and from this point the result was never in doubt. The Canadians rowed gamely, but were beaten by two lengths in 7mins. 28secs. The American crew soon got ahead of the French in their heat, and scared a comfortable win by three lengths in 7mins. 40secs. The best race of the day was provided by New Zealand and Cambridge University. The All Blacks had a slight lead at Fawley and maintained it until the mile was passed. Then Cambridge came with a great spurt, to win by three-quarters of a length. Time 7mins. 17 secs. The draw for the second round resulted in Australia No. 1. crew being opposed by Cambridge University, and Oxford University by America. Those who anticipated great races were not disappointed. That between Australia and Cambridge was started first, at 12.5 p.m. Rowing a slightly slower rate, the Australian crew began to show out from Cambridge as soon as they settled down after the burst off the mark. When half a mile had been covered the Australian boat was half a length in front, and the coxwain, in his anxiety to lose as little as possible by having the outside position, came in too close to the other crew. In fact, the bow oars of the Australian boat washed the stroke oars of Cambridge, and there was imminent risk of fouling. Captain Disher, the stroke, ordered the cox to pull out, and he did so — much too far. Soon afterwards Australia again went into Cambridge water, washing them a second time. The order by the stroke was repeated, with the same result. The crew was eventually straightened up in a position on the course well clear of their opponents, and the race developed into a titanic struggle. 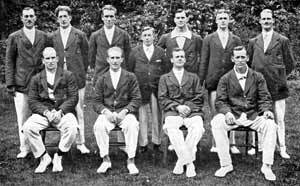 At the mile, Cambridge quickened their stroke, in essayed the task of overhauling the Australians, who had established a lead of nearly a length. It was a magnificently fought-out finish, the Australian crew winning by three-quarters of a length. The time was 7mins. 24secs. The erratic steering of the Australian crew caused a lot of comment, and press criticisms were not favourable. Had the crews touched, there would have been no option for the umpire but to disqualify the Australians. There was, however, not the slightest intention on the part of the crew to interfere with Cambridge, and the unpleasant incident was caused solely by an over-zealous coxswain. In the other heat of the semi-final the Oxford crew defeated the Americans The latter led the way over three parts of the course, but Oxford came with a splendid strong finish, and won by a length and a quarter. Time 7mins. 25secs. Oxford University and the A.I.F. No. 1 Crew were the finalists in this historic race, and the chances were widely discussed. The race was set down for decision at 12.30 p.m. on the final day, Saturday, July 5th. Races at Henley, it might be mentioned, are rowed against the stream, which flows at the rate of about half-a-mile an hour. The Australian crew drew the outside position again, known as the Berks station. The race was followed in the umpire's launch by Princess Arthur of Connaught, and Australian soldiers turned out in force to view the event. The crews got away to an even start, and, in accordance with their previous record, the Australians were quicker to move, and took a lead. They went ahead earlier than was expected, and soon settled down to a slower rate of striking than their opponents. As they turned the slight bend in the course the Australians swung into a line straight down the centre of the river, and a great cheer arose from their supporters as the first indicator showed them to be half a length ahead of Oxford. Before reaching Fawley, which was passed in 3mins. 25secs., the Australian crew had increased its lead to a full length, and thereafter the result was never in doubt. Despite repeated efforts by Oxford, the A.I.F. crew won by a clear length in 7mins. 7secs., which was the fastest time recorded for the full course during the Regatta. The Australian crew were firm favourites for the race. Oxford rowed gamely, and very well but the opinion among the crew was that they met the Australians at their best. It was certainlv the best row that No. 1 Crew had done, their race against Cambridge on the previous day apparently having improved them. They gave a good exhibition of rhythmic rowing and had no zig-zag steering to interfere with their efforts. Without undue bustle for a lead at the start, they showed out early from their opponents, and while rowing a slightly slower rate all the way, they were always the faster crew, and settled into that powerful racing swing and drive with length, which produces the maximum pace in the Australian style of rowing. July 5th, 1919 was a great day for the thousands of Australians who found their way to Henley. 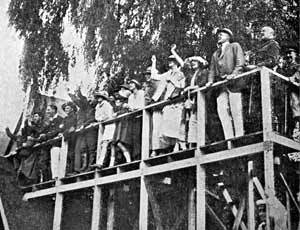 The Sports Control Board had erected a stand for Australian soldiers on the river bank, and this and a free afternoon tea provided by the Y.M.C.A. were availed of by large crowds. 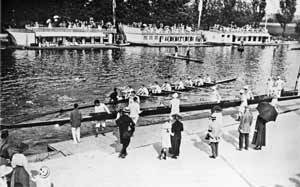 Visitors to Henley on that day had an experience of the "Diggers" enthusiasm when the crew won the King's Cup. They went mad with delight. Another stand had been erected on the lawn at the crew's headquarters. This commanded a fine view of the. finish, and two-thirds of the course, and was the scene of another wild demonstration when the Cup was won. Princess Arthur of Connaught presented the Cup to Captain H. C. Disher on behalf of the crew at the end of the day's racing, while each member of the crew, including the coxwain, received a handsome medal. 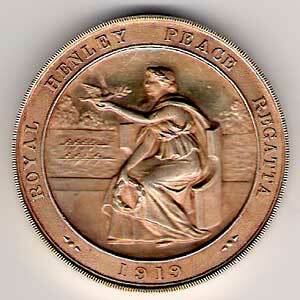 The medals are 45mm in diameter, silver with a gilt finish. Two members of the A.I.F. Wattle Club entered for the Hambleden Pairs - H. H. Sharp (bow) and G. E. Rogers (stroke). They created a mild sensation by beating the brothers Swann, of Trinity Hall, Cambridge, in their heat, rowing very gamely after being led most of the way. In the final they met the brothers Buxton, of Third Trinity, Cambridge, and the A.I.F. men were beaten by three lengths after a race that was not long, in doubt. All entrants in the pairs were handicapped to a large extent, the Wattle Club pair by getting together only at the eleventh hour and by inability to secure a suitable boat, and the others by rowing in other more important races during the Regatta. Early in the training it was decided to leave coxwainless rowing alone, and concentrate on the two eights. 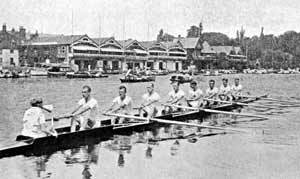 However, just before entries closed it was decided to enter a coxwainless four in order to have a second string in the event of the eight-oar crews meeting disaster early in the Regatta, and the following members of the first eight made up the boat : G. W. Mettam (bow), S. A. Middleton (2), H. Hauenstein (3), and F. A. House (stroke). The steering was done by No, 2, but he had not had an opportunity of improving on his Marlow form, and made an early start on a tour of investigation of all parts of the river except that allotted to his crew. Before they had rowed twenty strokes in their heat against New Zealand, the A.I.F. boat crashed into their opponents' craft. New Zealand claimed and were given the race. The Australian crew had plenty of pace, but had not had time to master the steering, and had very little practice together. Taken right through, the opinion among Australians is not favourable to coxwainless rowing! The Regatta, despite bad weather, was a great success, and quite an eye-opener to the thousands of Australians who visited the historic course for the first time. The rowing party had been a very happy family during the long period of training. There was only one short break in training operations, when the crew spent a few days at Birchington as the guests of Mr. W. S. Robinson an Australian who was ever ready to do anything he could for Australian soldiers. Both at Putney and Henley the crews took the keenest interest in their training. Discipline was necessarily rigid, but all rules were observed at all times, and changes in crews, causing keen disappointment in some cases, were accepted uncomplainingly. This admirable spirit and the total absence of petty bickerings made the whole period of training a very pleasant one. A keen interest was taken in the crews' training by Senior Officers of the A.I.F. and Australians resident in London, and they were always helped on their way by heaps of good advice, criticism, and good wishes. Many distinguished soldiers paid visits to the crews' quarters, included among them being General Sir Wm. Birdwood, Lieut.-General Sir John Hobbs, Major-General E. Tivey, Brig.-Generals T. Griffiths and T. A. Blamey. No. 1 Crew. - Sergt. A. R. Robb, 11st. 10lbs. (bow); Lieut. F. A. I House, 11st. 12lb. (2); Lieut. T. McGill, 12st. 10lbs. (3); Gunner A. V. Scott, 13 st. (4); Lieut. H. Hauenstein, M.M. 13st, 9lbs. (5); Major S. A. Middleton D.S.O., 13st. 6lbs. (6); Gunner G. W. Mettam, 11st. 12lbs. (7); Capt. H. C. Disher, 11st. 1lb. (stroke); Sergt. A. E. Smedley, 8st. 1lb. (cox). No. 2 Crew. - Lieut. J. Howieson, 10st. 11lbs. (bow); Sergt. G. M. Penny, 11st. 9lbs. (2); Sergt. E. J. Harrison, 12st. 2lbs. (3); Lieut. H. A. White, 12st. 5lbs. (4); Major W. A. Audsley, D.S.O. 13st. 3lb. (5); Corpl. J. K. Cogle, 12t. 3lbs. (6); Gunner J. A. Begg, 13st. 1Ib. (7); Lieut. H. R. Newall, 11st. 6lbs. (stroke); and Lieut. O. J. Wood, 10st. (cox).